Printer and editor at Amsterdam; contemporary, and undoubtedly a relative, of Aaron Abbas. 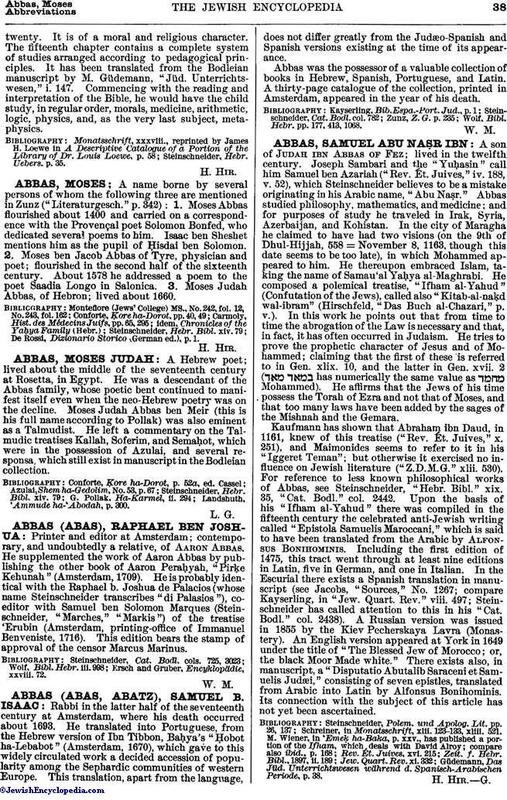 He supplemented the work of Aaron Abbas by publishing the other book of Aaron Peraḥyah, "Pirḳe Kehunah" (Amsterdam, 1709). He is probably identical with the Raphael b. Joshua de Palacios (whose name Steinschneider transcribes "di Palasios"), coeditor with Samuel ben Solomon Marques (Steinschneider, "Marches," "Markis") of the treatise 'Erubin (Amsterdam, printing-office of Immanuel Benveniste, 1716). This edition bears the stamp of approval of the censor Marcus Marinus. Ersch and Gruber, Encyklopädie, xxviii. 72.